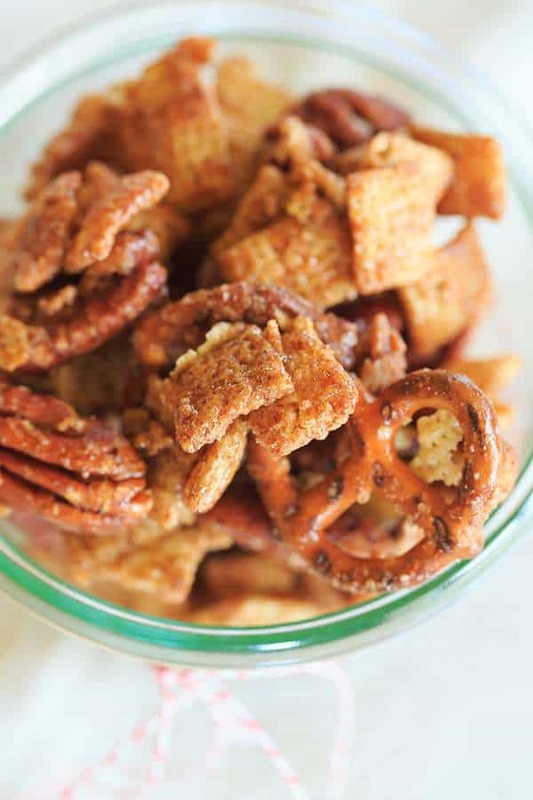 Chex Mix with a holiday twist! 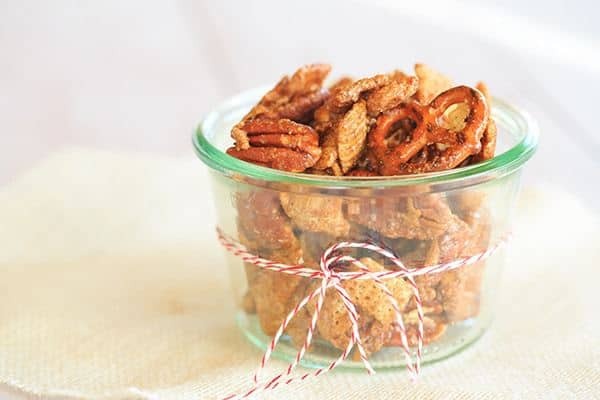 Cinnamon-sugar candied Rice Chex cereal with pecans and pretzels. Chex Mix has long been my road trip snack of choice, but it wasn’t until a few years ago when I started making it myself at home. 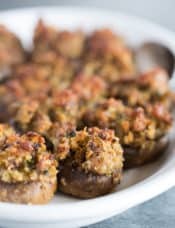 I’ve made a couple of different versions, but they have always been savory. So when I got a big box last week from General Mills with all sorts of holiday goodies, including a box of Rice Chex and a recipe card for candied Chex mix (which was developed by Ali from Gimme Some Oven), it took me all of one day before I whipped up the recipe. 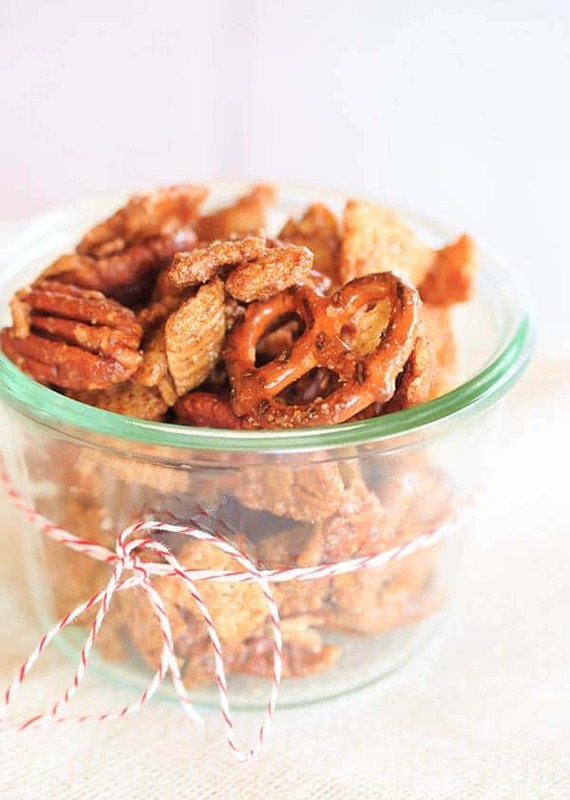 I’m already madly in love with candied pecans, so I assumed that I would be completely smitten with this candied Chex mix. I was absolutely, positively correct. 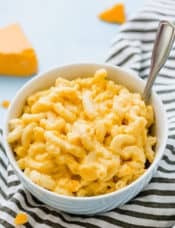 First, toss together all of your dry ingredients, then whisk together your egg whites until frothy and coat all the cereal mixture. Next, mix together the sugars and cinnamon, throw that onto the cereal, pecans and pretzels and toss again to coat everything. 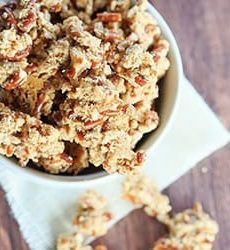 Spread on a baking sheet and bake for about 45 minutes… once it’s cooled, you’ll have wonderful cinnamon and sugar-coated clumps of Rice Chex, pecans and pretzels. 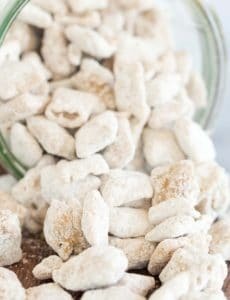 It’s the perfect sweet and salty mix to keep on hand for company or to give away as hostess gifts or holiday goodie bags. The original recipe calls for cayenne pepper, which I used as written, but would probably delete it next time. The mix isn’t spicy, it just has a tiny amount of bite, but I think I’d prefer to just go for all sweet. I left the cayenne in the recipe, but noted it as optional. My husband said that this tastes very similar to Cinnamon Toast Crunch, and I do not disagree. I haven’t been able to stop sneaking handfuls of this every time I wander into the kitchen. Grab a bowl, load it up, and watch Elf over and over again! Preheat oven to 300 degrees F and adjust oven racks to upper-middle and lower-middle positions. Line two rimmed baking sheet with parchment paper. 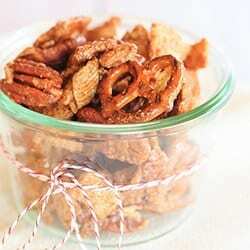 In a large bowl, toss together the cereal, pecans and pretzels. In a medium bowl, whisk together the sugars, cinnamon, salt and cayenne (if using); set aside. In a small bowl, whisk the egg whites until frothy. 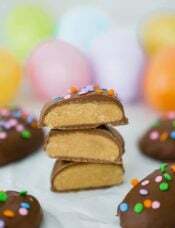 Pour the egg whites over the cereal mixture and toss with a rubber spatula until the mixture is completely coated with egg whites, 1 to 2 minutes. 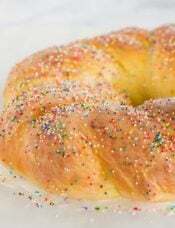 Add the sugar mixture and toss again until everything is evenly coated. 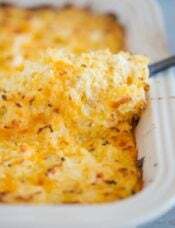 Divide the mixture between the two baking sheets and spread into an even layer. Bake for 45 minutes, stirring each pan and rotating them halfway through baking. Allow to cool completely at room temperature. 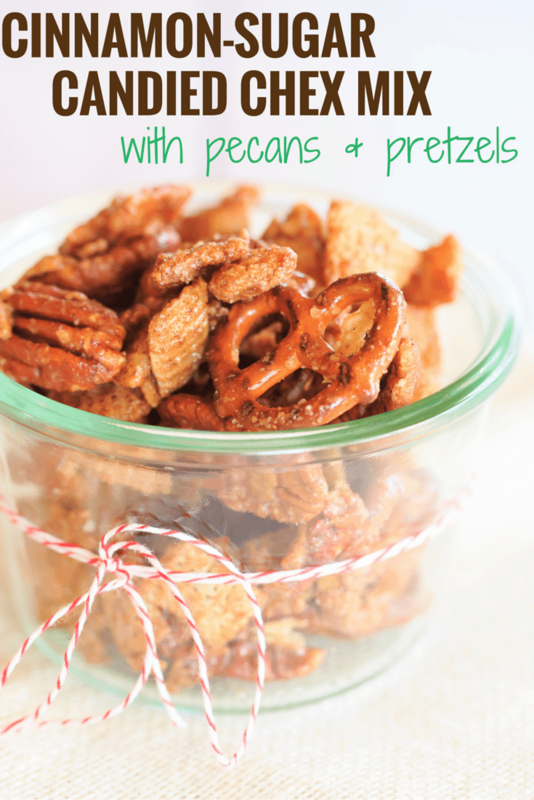 The snack mix can be stored in an airtight container at room temperature for up to 2 weeks. I would eat this mix in one sitting. I love cinnamon coated stuff! Thanks for sharing! I made this this wknd & we loved it! Yummy I love chex mix it’s so good! This looks amazing. I could eat a whole bowl of this on my own. I bought all the ingredients to make this for gifts. I’m also adding some peanuts and goldfish pretzels just for more variety. I can’t wait to try it! 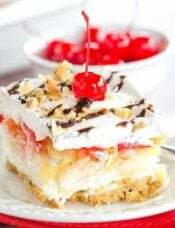 Ahhhh … making this as soon as possible! I’m thinking this could be even better than puppy chow. 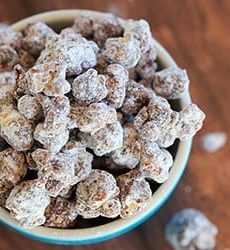 I made the sugar and spice nut mix that you recently posted and it was amazing! This one looks great too! I can’t wait to give it a try ! I love spicy chex mix but never tried the sweet version. Would love to try this. Thanks for sharing! I have a son who will not eat anything with pretzels or Oreo’s. Think I have lost my spicy Chex mix that we all liked so well. Great minds must think alike. We made a savory, spicy version this weekend. In fact it made an entire 5 gallon bucket full. We make it for our kids and grandkids and give it as gifts. I’ve never had a sweet version — I’d love to taste it. Next year we’ll have to try it.